David Bestué – Marc Vives. Interventions and actions in the town of Mataró, Presentation of the project Decorate your town at the Espai taller in carrer Concepció, Mataró. Latest activity: Canapé per l’olla de grills. Presentation of the book Bones Accions 1991-2001 by Joan Casellas. 8th Series of conferences headed by Xavier Riu, 13, 20, 27 November, and 4 and 11 December 2002, Fundació Caixa Laietana conference hall, Mataró. With Enric Casasses, Perejaume, Arnau Pons, Carles Hac Mor and Manuel Guerrero. 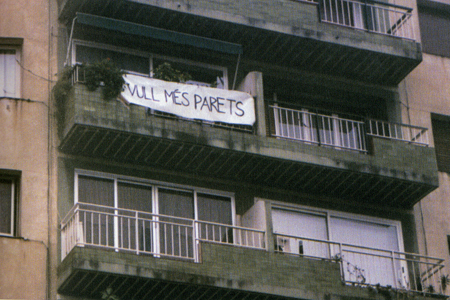 (Català) Exposicions a l’aparador de la perruqueria AKA del carrer Escudellers de Barcelona. Col·laboració entre ACM i La Cosa. 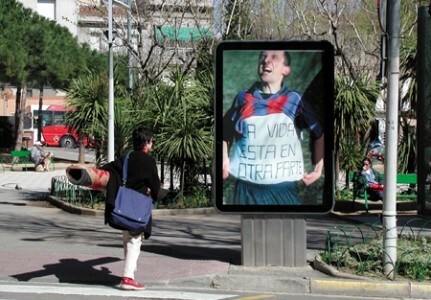 Art interventions on twenty-one billboards and bus shelters distributed around the town. 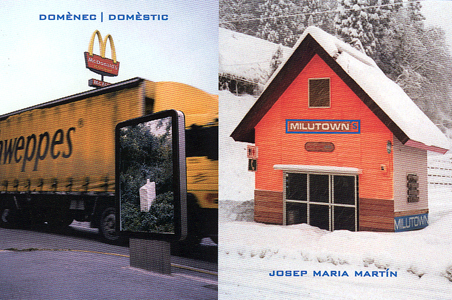 Twenty artists from various places –Mataró, Seville, Barcelona, Malaga, Madrid, Mexico, Colombia, France, Germany, Belgium, Thailand, Japan– took part in this project in an attempt to change the unidirectional messages of advertising and recoup these areas as places for reflection, doubt, critique, paradoxes a simple free beauty. Artists taking part: Carlos Amorales, Akané Asaoka, Kai-Annett Becker, Betty Bui, Minerva Cuevas, Santiago Cirugeda, Domènec, Fuera de Registro, Harald Fernagu, Vincent Emmanuel Guitter, Toni Giró, Rogelio Lopez-Cuenca, Josep M. Martín, Dani Montlleó, Nadín Ospina, Javier Peñafiel/Ludger Knepper, El Perro, Glòria Safont-Tria, Rirkrit Tiravanija, Erich Weiss. Presentation of the catalogue at sala H in Vic, on 1 March 2002. Taking part: Manuel Guerrero, Pep Fernández and Domènec. Presentation of the catalogue in RAS, Barcelona on 25 April 2002. Taking part Manuel Guerrero and Martí Peran. 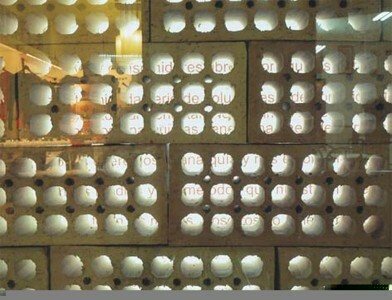 Series directed by Manuel Guerrero and Jordi Carrión, held from January 2002 to May 2003 at the Robafaves Bookshop in Mataró. 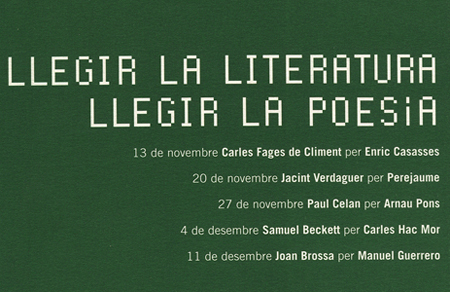 An initiative by ACM and Robafaves, in partnership with the Patronat Municipal de Cultura in Mataró and the Institució de les Lletres Catalanes. The narrators were presented by renowned critics in the Robafaves bookshop once a month. The dynamics of these events were as follows: a) an introduction by a literary critic; b) reading a brief text by the author (story, etc.) 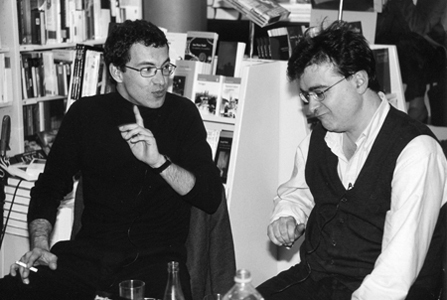 c) conversation between the author and critic; d) debate among the public attending. Presentation of the anthology entitled “Sense contemplacions, nou poetes per el nou segle” (Without Contemplations, Nine Poets For The New Century) By Manuel Guerrero. 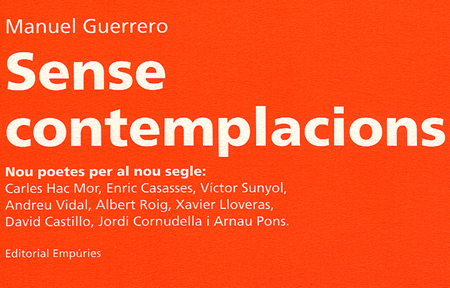 Featuring Joan Tarrida, Carles Hac Mor, Enric Cassases, Albert Roig, Xavier Lloveras, David castillo and Jordi Cornudella.